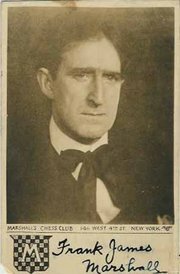 Frank James Marshall (August 10, 1877 - November 9, 1944), was United States Chess Champion from 1909-1936, and was one of the world�s strongest players in the early part of the 20th century. He was born in New York City, and lived in Montreal, Canada from ages 8-19. He began playing chess at the age of 10 and by 1890 was one of the leading players in Montreal. He won the U.S. chess championship in 1904, but did not accept the title because the current U.S. champion, Harry Nelson Pillsbury did not compete. In 1906, Pillsbury died and Marshall again refused the championship title until he won it in competition in 1909. In 1907 he played a match against World Chess Champion Emanuel Lasker for the title and lost 8 games, winning none and drawing 7. They played their match in New York, Philadelphia, Washington, DC, Baltimore, Chicago, and Memphis from January 26 to April 8, 1907. In 1909, he agreed to play a match with a young Cuban named Jos� Ra�l Capablanca, and to most people�s surprise, lost 8 games, drew 14 and could only win one. After this thrashing, the chivalrous Marshall became one of Capablanca�s biggest supporters, insisting the Cuban be invited to play in the international tournament at San Sebastian in 1911. San Sebastian was an exclusive tournament, designed to be one of the strongest ever held, inviting only masters who had proven themselves by winning lesser tournaments. Capablanca was allowed to play, largely on Marshall�s insistence, and Capablanca repayed Marshall�s endorsement by not only avoiding being thrashed, but instead actually winning the tournament. At St. Petersburg in 1914, Marshall became one of the five original "grandmasters" of chess. The other four were Lasker, Capablanca, Alekhine, and Tarrasch. In 1915 he opened the Marshall Chess Club in New York. In 1936 he relinquished his US championship title to Samuel Reshevsky who won a tournament for the US championship, sponsored by the National Chess Federation, and held in New York. The Marshall Chess Club donated the trophy. Marshall held the US title for 29 years. Frank Marshall has a number of chess opening variations named after him, most notably the Marshall Attack in the Ruy Lopez (1.e4 e5 2.Nf3 Nc6 3.Bb5 a6 4.Ba4 Nf6 5.O-O Be7 6.Re1 b5 7.Bb3 O-O 8.c3 d5 in algebraic notation). Marshall came up with this attack in a game against Jos� Ra�l Capablanca in 1918. Even though he lost, his opening idea became quite popular. Capablanca rarely lost in the endgame. This article is based on the article Frank Marshall from the free encyclopaedia Wikipedia and stands under the GNU-Licence for free documentation. In the Wikipedia a list of the authors is available.